At a time when turntables grow more colossal, expensive and complex, with external flywheels, multiple motor pods, crisscrossing belts, vacuum pumps and beastly stands apparently fit to seat the 5000 lbs gorilla, Alvin Lloyd's new Monaco direct-drive turntable asks a very simple question: If cutting lathes use direct-drive nearly exclusively, how come most high-end tables insist on belt drive? Since belt drive clearly isn't suitable to cut records with when you consider the evidence of what's used by the best, why play the slabs o' vinyl back on belts? 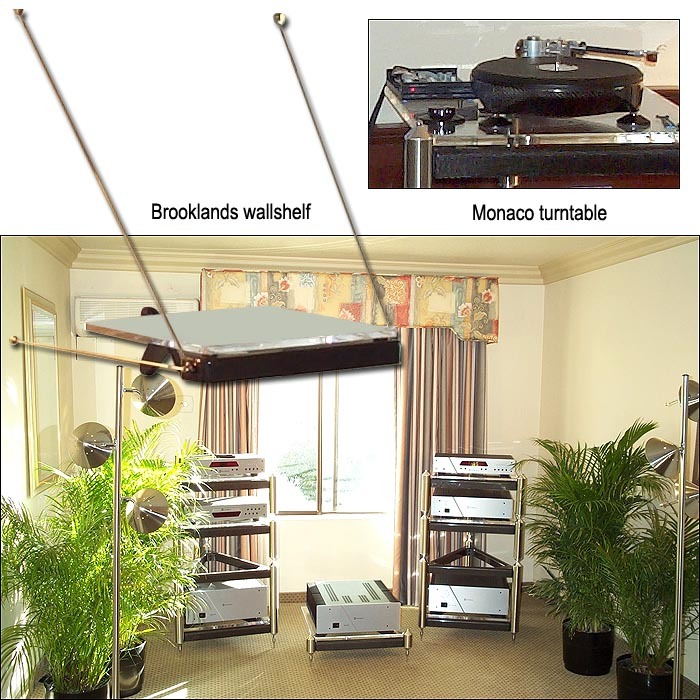 From the house of the famous Monaco equipment stand now comes a turntable that seems hellbent on not only proving without a doubt that Grand Prix Audio has very serious engineering chops but also, that the current trend of aggrandizement in the turntable sector is perhaps nothing more than window dressing for trophy HiFi hunters. Of course we'll have to wait for word from the real experts on that count - if they dare give this product a fair shot in the face of far more famous and expensive belt-drive machines with all the expected trappings. However, if GPA's existing track record with resonance control devices is any indication, this table should be an ultra performance product with demonstrable and even measurable advances. Which begs another question. What other equipment stand maker even has the expertise to design a clearly unique turntable from the ground up? Pause. By the way, introductory retail is $15,999 without arm. New also from GPA is the Brooklands wall-mount, essentially a Monaco stand for turntables that gets suspended from the wall and uses the same Carbon/Sorbothane technology as the floorstanding affair, albeit purposefully adapted to its new location. A single-tier Brooklands retails for $2,250 and each additional tier adds $1,950. Very conservately rated, max weight for the wall rack (regardless of number of tiers) is 200 lbs.